The Scripture Education Agriculture Research Community Health (SEARCH) Institute has been in place for over a year now. We are very busy! We started Plantel VEAS in 2013. 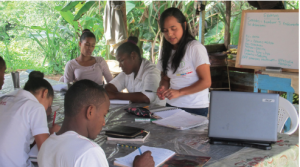 Plantel means training center and VEAS is an acronym for Truth Education Agriculture and Health. We train missionaries, and we started with eight students. One of our staff was a volunteer from Colombia and several people from our local church come to help every day. The results have been tremendous. We have the attention of the community, the church, and many young people around the country who are interested in this type of training. Currently, we are expecting 12 students for the next session as well as a worker from California who will help teach massage as a trade skill. I pray that God will send the right people and funds to help. We have a few small industries but they do not yet meet the cost of training. Our agriculture has blossomed to the point where we are almost out of land. But we advance by faith. We feel an urgency to keep moving forward each day while preparing to meet the Lord. One of our evangelistic efforts was to produce videos to distribute here in the Dominican Republic and on YouTube. 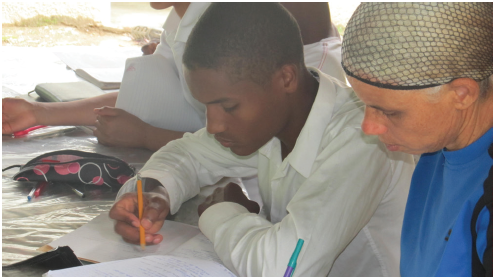 Our youth have learned sustainable agriculture practices, medical missionary skills, and much Bible truth. We love them like our own children and they will forever be a part of our family and involved in our growing plantel. We welcome your prayers for these young workers. 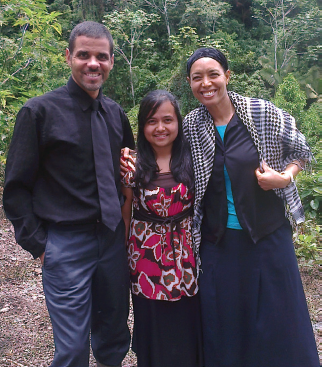 Here are two stories: one by Tatiana, our Colombian volunteer, and the other by Gabriel, one of our young missionaries. Today I look back on my life and I can see that God has been guiding me all along. It is for that reason I want to encourage everyone who accepts God as their everything. I was born in Colombia in an Adventist home that consisted of my mom and dad and two brothers. I am the youngest and the only girl. I was raised with very good principles. I was four when we moved to the country and until I was 11 my mother was my only teacher. She taught me all that could be learned by a child in that stage. We were then invited to work at a ministry called Las Delicias. There I developed more and I had the opportunity to study medical missionary work and put into practice that which I had already learned. The Eastons with Tatiana after church. Like every youth, I came to the age where I had to decide to follow the ways of God or my own inclinations. It was not easy to make this decision, because my brothers had left the ways of God and their negative influence was very contradictory to the plan God had for my life. When I was 16, I decided to continue persevering in the Christian life, even though it went against my feelings. The love and example of my mother was my motive. I really didn’t have a personal experience with God yet. Between 16 and 20 I finally began to have the experience with God that I needed. At 20, I decided to give Him my life completely and serve Him no matter what the circumstances and I was baptized in 2013. That same year I received a call to assist another ministry in the Dominican Republic after I finished my studies. I traveled to the plantel, not knowing anyone. Brother Easton picked me up at the airport and he talked about the beautiful ministry that he, his wife, and some supporting families were developing. My experience with this ministry has allowed me to put into practice everything that I had learned. Along with help from the Eastons, God gave me the wisdom I needed to develop a program to teach the youth classes. In the afternoons I taught health classes while Brother Easton taught Bible classes. We even started a small chorus. Soon my time here will come to an end, but I can say with all my heart that it was worth it. Serving the Lord is always worth it! When we give ourselves to Him, many things may seem to be too much to bear, but they all will be converted into joy because through them we learn to love Him who loved us enough to send His Son. Let us never forget that God is real and personal. In my 16 years the Lord has guided me in surprising ways. He made me understand how much He needs me and moreover, how much I need Him. Last year He gave me the opportunity to study in a plantel. I left home for the first time and I felt frustrated due to my lack of intellectual, physical, and spiritual development. The first three months were very difficult for me. I remember the first day I arrived. There were 15 others besides me and I felt shy. The diet, work, and everything was strange. It took a lot for me just to learn how to write as fast as my seven study companions, and I often felt mad at myself. One night I even cried. Six years had passed since I had taken writing seriously enough to be able to handle classroom study and maintain the pace of the assignments. I went to bed past midnight often trying to write what I couldn’t put down fast enough in class. It was hard striving for what seemed like I’d never achieve. What helped me most were my good habits of listening and reading that I had developed in my home, for the glory of God. Also the good counsels of my parents, especially my mom. I began to take notes at the same pace as the instruction of my teachers. This step opened new doors for me. I began to write all that I had learned each day and from prior classes and I started to advance at a good pace. This was a big intellectual jump for me. Now I had to grow spiritually and physically. The physical part wasn’t too hard because I had worked hard at home. The work was different but I adapted. As for my spirituality, I can say that Jesus, my faithful Friend, has given me extraordinary help. He has shown me things that I never had thought of or studied in my life. I don’t have words to write or voice to express the great love He shows me. I have been convinced now, at age 17, that I was born for a reason and to complete a plan. He brought me into existence—not for no purpose—but that through my words and example I can serve and help Him and others. Today, I have a definite purpose for my life and I feel I have 1000 reasons to live. He shows me His love every day. At times He has strongly rebuked me, but I have learned to respond, “Thank you Lord for loving me so much.” Today and every day I have temptations, tests, battles to win, and every class of evil to overcome, but by faithful study of His word He has made me “more than conqueror.” My faith is now founded in Him who is the Author of Life. By Elvin Easton, Tatiana, and Gabriel at SEARCH Institute. Email: missionfamily@gmail.com. Support for this work can be sent to TLC, PO Box 36, Oakpark, VA 22730.